NUTREN JUNIOR® -Complete Liquid Nutrition For Children. When a child can't consume adequate calories from regular foods, this whey protein-based pediatric formula provides complete nutrition to help support a healthy nutritional status. Oral\Tube. Helps meet the nutritional needs of children with a whey protein-based formula. Adequate nutrition is key to a child's growth and health. NUTREN JUNIOR® is a well-tolerated tube feeding formula or oral supplement that contains 50% whey protein to support better tolerance. Ingredients: Water, Maltodextrin, Sugar, Milk Protein Concentrate, Soybean Oil, Contains less than 2% of Whey Protein Concentrate, Canola Oil, Medium Chain Triglycerides (from Coconut and/or Palm Kernel oil), Artificial Flavor, Calcium Citrate, Soy Lecithin, Potassium Chloride, Magnesium Phosphate, Sodium Phosphate, Choline Chloride, Potassium Hydroxide, Sodium Ascorbate, Potassium Phosphate, Carrageenan, Salt, Taurine, Alpha-Tocopheryl Acetate, M-Inositol, L-Carnitine, Ferrous Sulfate, Zinc Sulfate, Calcium Pantothenate, Niacinamide, Vitamin A Palmitate, Vitamin D3, Manganese Sulfate, Thiamine Mononitrate, Pyridoxine Hydrochloride, Riboflavin, Copper Sulfate, Beta Carotene, Folic Acid, Biotin, Potassium Iodide, Chromium Chloride, Sodium Molybdate, Sodium Selenate, Vitamin B12. Health Conscious. Parent of picky-eater. It tastes really good and keeps my son's weight up. I don't worry about his poor eating as much. Highly recommend. Health Conscious. First Time User. I have five children (one an infant)and got this as one of my children had not been eating as well. Of course, when we got the product, he(age 4)did not like it. My daughter(age 7)liked it for about a week, then would not drink it. My son (age 5)who will not eat fruits and vegetables loves it. He drinks one everyday. My toddler (2) drinks it occasionally. Basically, it is a winner with only one of my children. It does allow me to relax a bit about his nutritional intake. We supplement a Nutren Jr for a milk at meal time. Good Taste. Acts Quickly. Produces Results. Simple To Take. my son as seizures and it affects his food intake. he likes the taste and it has the calories he needs to grow. I use this product for my 8 year old boy. He was under weight for three years. I just bought this product three weeks ago. My son has been drinking it for two weeks and his weight increase by one pound. I will buy it again. My son can't get enough!! Perfect supplement. Gluten-free. Good Smell. Tastes yummy. Good Value. Effective. Easy To Use. Children will love this. Daily Use. My son was diagnosed with celiac disease and was not gaining weight as he should. He needed to boost his caloric/nutritional intake. After trying many different brands, we came across Nutren Jr. Not only is it very palatable (tastes like a vanilla milkshake), it did not make him burpy or gassy like the other brands ~ and he is finally drinking enough and gaining weight! I highly recommend Nutren Jr. for anyone needing additional calories/nutrients - from the picky eaters to those with a true medical issue. This is the best, and has really changed my little one's life for the better. He is finally on the weight charts again. 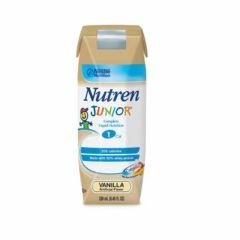 Is nutren junior a dairy product? I am looking for a supplement for a toddler that is lactose intolerant. It does contain whey protein. However according to Nestle's website, it is appropriate for lactose intolerant diets. It has a low osmolality rating which also makes it easier to digest and tolerate. My son formerly used Neocate formula for 2 years before his GI doctor recommended this product as a lower cost alternative. He's used Nutren Junior for 9 years now with only positive results. This is just another GMO junk food for young children. No wonder young ones, today, are so unhealthy. Try raw cow or goat milk or a decent yogurt or kefir. We use Nestle Compleat to tube feed our toddler. It has chicken, cranberries, vegetables, etc. I has worked very well and does not have dairy.